Today was one of the days I was most excited for… The day I bought Napkin’s wedding band! I remember two years ago when I had first moved in with him and had somehow dragged him to the mall… only to have him drag me into a Reed’s Jewelry to look at wedding rings for “ideas.” I embarrassed myself that day, laughing and trying on rings and annoying the saleswoman. When my finger was sized and the Tacori samples exhausted I ran to the bathroom and called my Mom to gush. So last weekend, I had somehow dragged Napkin to the mall again to visit Reed’s to look at different bands for him. I had imagined Napkin to have very few opinions about rings. What I thought would end up happening was that I would buy him a sterling silver band, thin and plain and that would be the end of it. But holy moly was I wrong! Napkin had already done a good amount of research on materials and what his married co-workers and friends were wearing… and so when we got to Reed’s he was well aware of their selection and what he was leaning towards. At first, we looked at some platinum bands, 6 mm and with gold “routing” (<— Napkin taught me that term, it’s the little lines of engraving or whatever you see in a band.) 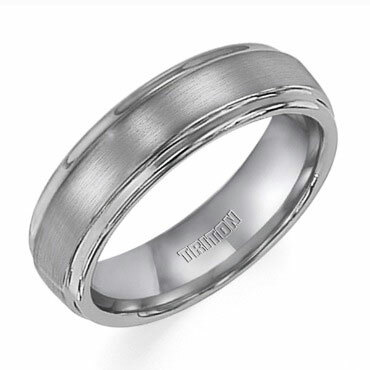 He liked them a little, liked the solid titanium bands better, the titanium bands with “routing” even better… but kept looking at the tungsten carbide bands. I didn’t know what that was either, don’t worry. It’s basically a nickel based material with a molecular level (<– what?) that makes it nearly indestructible. It’s darker than the titanium bands, a muted gray color. We couldn’t decide on anything that day so we decided we would come back again. Cut to me dragging Napkin to the mall a third time! 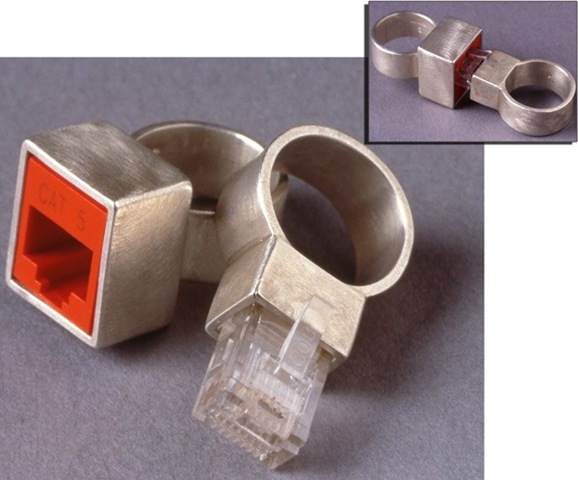 We hadn’t talked about our ring options much after the first visit… so I was prepared for another perusal, discussion… but again! I was wrong! “Do you carry this band? This is what I’ve decided on.” The entire week he had researched bands, band-widths, shapes, colors, materials…and fifteen minutes later– I was at the register buying the ring he’ll wear forever!! Isn’t it lovely? It won’t have the Triton (how manly) logo on the inside but this is the only internet picture I can find. I absolutely can NOT wait to put this ring on his finger come October 7th, 2012. Tags: Best Dude, mens wedding bands, Reeds Jewelers, Routing, Southpoint Mall, Tungsten Carbide. Bookmark the permalink. Previous post ← My (Potential) Catering Nightmare.